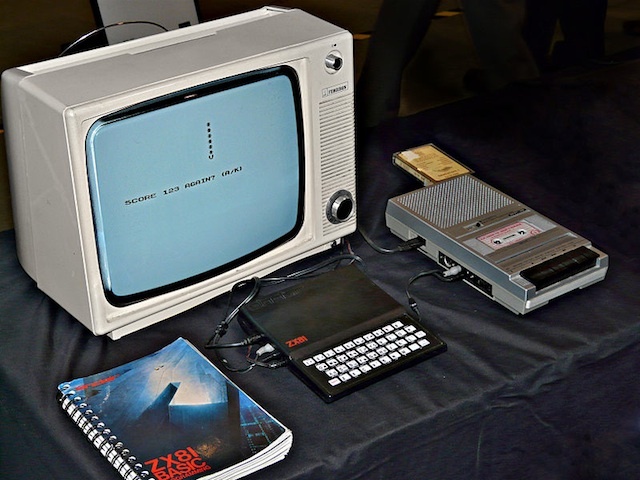 Last week was the 30th anniversary of the Sinclair ZX-81. I missed it. Am I that old? Yeah, unfortunately I am. Sigh. My first sight of one of these things was as at school. Some other kid–I can’t remember who now–brought one to class and was showing it to everyone. Ah – the technology of our youth, eh? All geeks are cordially invited to reminiscence. No fisticuffs over who’s toy was better! * And, it seems, very little else! Haha. ahh I remember coveting these through the window of David Reid Electronics stores. Although I didn’t get a real computer to play with until the BBC Model B.. None of this Commodore 64 nonsense! First proposal I eve wrote was to persuade my school to buy a ZX80 (not 81) so I could start a computer club in the afternoons. They agreed, and great fun was had by all. It was a kit, too. Don’t do that sort of stuff in schools these days, I guess. I can remember thinking that the Beeb looked all class. I seemed to remember it being expensive, too, made of quality material. And that mix of black and orange keysâ€¦! A UK101 – that’s a model I havenâ€™t heard of – tell us more. Very patriotic name, although the 101 bit sounds like a beginner’s class. My first computer that I used was a Sharp MZ-80K at my school, sold by Knights Computers on Rosemount, Aberdeen. The first computer I bought was a Grundy Newbrain. I coveted the floppy disk drive but could never afford one and had to put up with cassette tape. I even spent money on a real compiler (Hisoft Pascal). I also coveted the BBC B but that was so expensive. One of my friends had a ZX Spectrum which I didn’t covet at all. I thought that the keyboard, with all the keywords printed on it, was ‘childish’. I had the 16k RAM pack with mine, which attached to the ZX81 via a really dodgy edge connector. 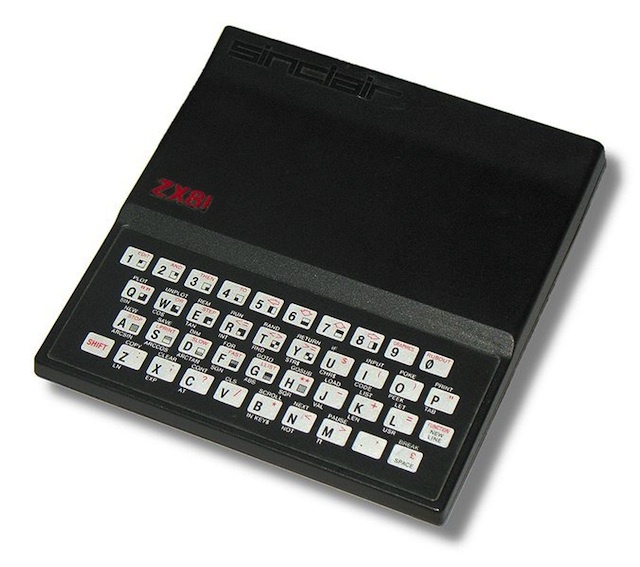 I remember buying the ZX81 magazines and typing in hundreds of lines of BASIC to have the latest games, and invariably the 16k RAM would wiggle at some point in the middle of typing all those lines, (due the the great pressure you had to use on the membrane keyboard), and freeze the computer, losing everything you had just typed in. I loved that computer though. …and when the fridge motor or heating system cut in, the surge would wipe memory of all the tedious BASIC code that you had entered. There was a tape drive as well. It was shaped like a frisby, so that when you threw it out of the window, it disappeared into the bushes. Funnily, I get sore fingers from my MacBook Pro (probably more the trackpad than the keyboard, though, I think). I can imagine typing at length on the membrane keyboard must have been a pain. (Erm, pun intended – after the fact.) There were some replacement keyboards weren’t there? The â€˜Grundy Newbrainâ€™. *Happy sigh* Iâ€™d completely forgotten about them until you brought it back to mind. Arenâ€™t some of the old names classic? Marketing divisions today would be horrified! I loved UCSD Pascal on my Apple. Not exactly fast, though. I still have the p-code book – itâ€™s in good nick too. I probably ought to blog about that at some time. Ah, my brother and I had a ZX81. I remember the RAM pack wobble. Shared between you? – you must have got on well. I was telling a friend the other day that the older Appleâ€™s had this huge motherboard only pinned down at the corners. If you worked on the machine for a longish time, the board arched up as it heated up. If it arched enough, it popped the RAM chips up, so you’d have to turn the thing off, let it cool down, and seat the chips back in the sockets. Popping RAM chips … no I don’t hear that one much these days. We have replaced it by enormous heatsinks attached to processors with even bigger fans attached to the heatsink. I’ve still got mine stashed away in a box somewhere. There were certainly many hours of fun copying the Basic program out of the magazine to thrill the kids with the B&W low res graphics on the 12 inch TV! Never had joy writing to or reading from the cassette. My ram pack bit the dust unfortunately. My first computer was a C64 with GeOS, which was sort of a clone of the first graphical MacOS. I think the word processor in GeOS was better than the version of WordPerfect than came with our first 386 many years later. Reading a file in from a tape recorder was fun too 🙂 Once the computer was set up to receive the file, you pressed the “play” button on the cassette player to send the file to the computer. I have always wondered what the annual computer recycling collection does with the more vintage models. You’d like to think that they try find a good home for them if possible, as they’d be worth more to someone that way.